Jackson: AutoNation would give its data to TrueCar "over my dead body." AutoNation and TrueCar split over the question of access to data. Here are some of the issues. Sticking point: TrueCar wanted data on all of AutoNation's vehicle sales, not just TrueCar-generated deals. TrueCar's view: The data are needed to audit AutoNation's sales to see which result from consumers going through TrueCar. Other dealership groups provide such data; AutoNation was an outlier. The data support a marketplace move toward transparency. AutoNation's view: TrueCar uses the data to claim sales in which it played only a tiny role. TrueCar could use the data to market to, or poach, customers as it moves into financing, service and other areas beyond sales. On Friday, May 8, over salads and sandwiches at TrueCar Inc.'s seaside Santa Monica, Calif., headquarters, CEO Scott Painter made the future clear to visiting AutoNation Inc. executives: He would no longer do business with the dealership giant if it didn't begin sharing a wide swath of customer data. After years of seeking that data -- which other dealership clients were already providing to TrueCar, but AutoNation was not -- Painter told the AutoNation execs the new rules were "nonnegotiable" and an "integral part" of TrueCar's business model. In other words, AutoNation's hall pass was over. Sales Data: In order to (i) receive Pay Per Sale billing in which Dealers shift 100% of marketing risk to TrueCar and (ii) have access to millions of deep-in-funnel customers using 600+ TrueCar-powered auto buying sites (TrueCar.com, TrueCar mobile, USAA, Consumer Reports, AARP, GEICO, Employee Buying Sites, AAA, American Express, U.S. News and hundreds more), it is a mandatory marketplace requirement that all participating Dealers provide TrueCar with continuous access to limited sales data covering all finalized sales records. This data is necessary to power our sales matching system, which is the basis for identifying sales in Pay Per Sale billing. Specific Fields Required: Customer Details (names, addresses, phone numbers and email addresses for buyer and co-buyer); Vehicle Details (VIN, year, make, model, trim, new/used flag, MSRP, stock number) and Deal Details (sale date, deal number, deal status, salesperson name, dealership ID). If Dealers want advanced analytics (at no additional cost) on how their transaction prices stack up in their local market, they also provide transaction details to TrueCar. Collection: TrueCar does not directly access Dealers' DMS systems and never has. In order to collect the limited sales data we need to power TrueCar's fully accountable billing method, AutoNation can either "poll" or "push". Under "polling," a trusted third-party like DMI (owned by CDK Global, Inc.) will securely collect the limited sales data defined above from AutoNation's DMS system. Under "pushing," AutoNation will directly deliver a daily file with the limited sales data above to TrueCar via a secure FTP site. To safeguard consumer Personally Identifiable Information, TrueCar requires PGP/GPG encryption of the file and SSH key authentication to access TrueCar's secure FTP site. Financial Terms: AutoNation has been a valued long-standing partner and we want to continue doing business with AutoNation in a mutually beneficial manner. TrueCar is the auto retail industry's only large-scale, fully accountable customer acquisition partner. TrueCar does not charge Dealers for impressions, listings, leads or clicks; rather, TrueCar only charges Dealers for sales (in applicable states). Additionally, TrueCar's current published Pay Per Sale service fees -- $299 for new vehicles and $399 for used vehicles -- are well below industry average. As good partners and recognizing that AutoNation is the largest auto retailer in the U.S., TrueCar will provide AutoNation an additional 10% discount off the TrueCar published Pay Per Sale service fees if greater than 90% of AutoNation stores use the TrueCar platform and abide by all marketplace requirements. We also realize that attribution – especially around same-day walk-ins and customers who also access AutoNation.com -- can be an issue and TrueCar will provide limited partial credits under clearly defined rules. Bottom-Line: The above billing structure and financial terms will provide AutoNation with a fully accountable solution that delivers a large and growing amount of sales with very attractive economics. By our estimates, the TrueCar platform was responsible for at least 7% of AutoNation's new vehicle sales in Q1 2015. As with all of our Dealer partners, TrueCar's investments are creating growth opportunities for AutoNation and we believe the TrueCar platform could represent more than 10% of AutoNation's new vehicle sales by the end of 2015.
requirements to preserve our brand, and to ensure an equitable playing field for our 10,000-plus Dealer partners and the car buyers that they serve. requirements. We are approaching this matter in a good faith manner and are hopeful we can continue being partners. "Over my dead body," AutoNation CEO Mike Jackson later told his team. With that meeting, the two parties were at an impasse, one that couldn't be overcome by Thursday when AutoNation severed ties with the third-party lead generator. "That's the breaking point," Jackson told Automotive News. "TrueCar says there will be no exception for AutoNation. Therefore, we're saying goodbye." The nation's largest new-car retailer will stop using the Internet vehicle shopping service on July 15. Of AutoNation's 240 dealerships, 226 had been using TrueCar. Painter disputes who fired whom. "We have an unwavering and long-term focus on a transparent car-buying experience," Painter said. "There's absolutely no benefit to consumers, dealers or the industry in reversing the trend to transparency." "We may not be popular," he added, but the dealers who work with TrueCar "are profitable because they're selling." TrueCar long had asked AutoNation to share data on all its retail transactions, not just the TrueCar-generated deals. That would mean sharing a list of 41 data points on the approximately 550,000 vehicles sold by AutoNation annually. Of those sales, AutoNation attributes just 3 percent, or about 16,500, to TrueCar. TrueCar disagrees with that tally. It estimates the TrueCar platform was responsible for at least 7 percent of AutoNation's new-vehicle sales in the first quarter and, had AutoNation gone along with TrueCar's proposed contract, that could have grown to 10 percent by the end of the year. "We know exactly the degree to which AutoNation underreported" sales, Painter said. "It's massive." The data demand has caused friction with other retailers, too. Dealers argue that turning over such an extensive pool of customer and transaction data raises issues about security, customer privacy and the potential that their customers will eventually be marketed to or poached. TrueCar executives told AutoNation they want all the retailer's transaction data for an audit function, Jackson said. TrueCar would then compare its database with AutoNation's and look for a match, so it could bill AutoNation for that sale. That alone is problematic, Jackson said. AutoNation argues that TrueCar is trying to lay claim to some sales generated by its competitors and AutoNation's own marketing efforts. "Customers go many places before and after a TrueCar visit, and just because they were momentarily on the TrueCar site doesn't mean I should have to pay them $300," Jackson said. "So there's a big disagreement there." Painter said consumers who want a transparent car-buying experience will do business with TrueCar while those who want to buy cars in a traditional manner will go to AutoNation. AutoNation says its cost for a TrueCar sale already is in the $550 range. That's higher than the $299 and $399 fees TrueCar charges for new- and used-vehicle sales, AutoNation says, because of the sales for which TrueCar unjustifiably takes credit. AutoNation currently pays TrueCar about $7.5 million a year. AutoNation estimates that would jump to more than $10 million if the data were shared and TrueCar were able to lay claim to more deals. The parties began negotiating last fall, as AutoNation's contract with TrueCar was originally set to expire March 1. Handling the talks for AutoNation were now-COO Bill Berman and Chief Marketing Officer Marc Cannon. For TrueCar, it was Painter, President John Krafcik and Mike Timmons, senior vice president of dealer development. Those five were in the May 8 meeting. The impasse reached that day was reinforced May 23 when TrueCar sent AutoNation a letter. TrueCar and AutoNation had further discussions after the letter. But by mid-June, negotiations had gone cold. Weeks of silence led up to AutoNation's July 9 notification. Over the years, as AutoNation tried to figure out how to tackle the divide between the experiences customers have shopping in dealerships and online, it even had former COO Michael Maroone take a position on the TrueCar board of directors from 2011 to 2012. Maroone was to explore whether companies such as TrueCar could help the retailer seamlessly connect its online and brick-and-mortar operations. The conclusion: No. In April 2014, AutoNation said it would reduce its reliance on third-party lead providers. It is investing $100 million in 2014 and 2015 to launch its own online buying service called AutoNation Express. AutoNation executives say the retailer's branding initiative and broader marketing efforts attract vehicle sales more efficiently than going through TrueCar. Marketing expenses for AutoNation-generated sales average $255 per vehicle, the retailer said. But those efforts don't explain the breakdown of the AutoNation-TrueCar relationship, Jackson said. He laid the blame at TrueCar's feet. "TrueCar has made some onerous demands in its new contract negotiations with us that are unprecedented in my 45 years in business and are unconscionable and unacceptable," Jackson said. "We cannot agree to them." By contrast, Jackson said he has no intention to drop other third-party providers at this time. 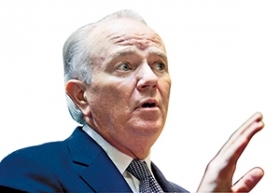 Ultimately, in Jackson's eyes, it makes no sense for AutoNation, as it works to build its own brand and digital footprint, to hand over a wealth of proprietary information. "Let's face it: TrueCar is a competitor," Jackson said. "TrueCar has made it quite clear they're not stopping at new-car sales transactions. They're going to inject themselves into the arrangement of financing, they're going to have a service product, they're going to have a trade-in product. So they're going for the entire spectrum." For TrueCar's part, without AutoNation, "we lose a great anchor relation, but we could raise revenue" as a result, Painter said. "Their decision not to comply is perfectly fine with us." Neal E. Boudette and Jamie LaReau contributed to this report.